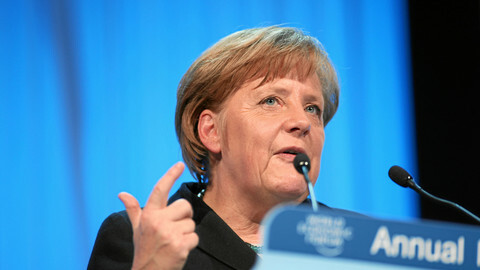 Before pundits were able to portray the German Chancellor as the stern head-mistress telling Greek Prime Minister Antonis Samaras that there would be no more sugar to coat the austerity medicine, Merkel launched her own pro-EU campaign - with a video-link entitled "Ich will Europe" - along with a raft of leading academics and politicians, and the German captain and Bayern Munich football star Philip Lahm. 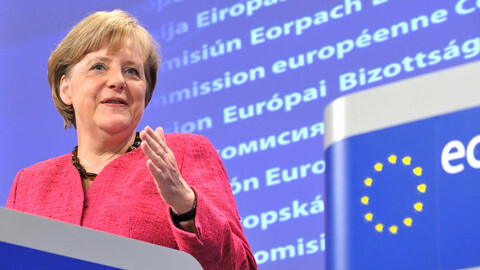 Asserting that the EU had helped deliver "peace, prosperity and understanding with our neighbours", Merkel added that she expected the 27-country bloc to come through the sovereign debt crisis with a "sustainable and strengthened eurozone and European Union". Unsurprisingly, the video is heavy on rhetoric rather than substance, but the underlying political message is clear: despite talking tough on debts, deficits and bail-outs Germany wants to remain at the heart of the European Union. 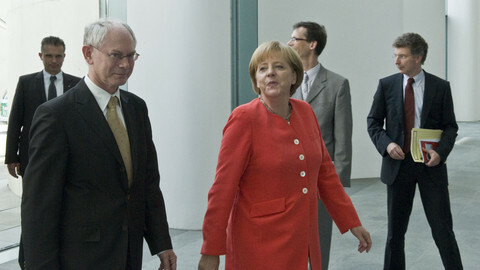 Nor was Merkel the only German Christian Democrat to affirm her European credentials this week. Earlier this week, the CDU's leader in the Bundestag, Volker Kauder, told Der Spiegel that Europe was still Germany's "future". In fact, what Merkel and her party are piecing together is a radical vision of the EU in a few years time - a deep fiscal and political union. The fiscal side involves tax harmonisation, a tightly policed Stability and Growth Pact with automatic sanctions for countries that breach debt and deficit rules, and the possibility of an EU Commissioner responsible for directly intervention to oversee budgetary policy in a crisis-hit country. Furthermore, CDU unease about joint liability eurobonds, or the Redemption fund proposed by the German Council of Economic Experts, does not preclude the new EU bail-out fund, the European Stability Mechanism (ESM), from evolving into a fully pledged European Monetary Fund. 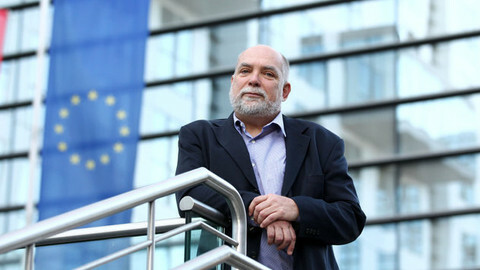 On the institutional side, the CDU backs a directly elected President of the European Commission as well as clearly establishing the European Parliament and Council of Ministers as a bi-cameral legislature with equal rights to initiate EU legislation with the Commission. All of this is based on the resolution "A strong Europe - a bright future for Germany" adopted at the party's annual congress last November. The policy paper is clear about the causes and nature of the eurozone crisis - it is about excessive levels of debt built up by countries that lived beyond their means and who, by failing to implement labour market reforms, became chronically uncompetitive. Eurobonds and a system of credit transfers between north and south are out but it amounts to a bold package that would go down well with many federalists. But if that is the German centre-right vision of Europe, the left has one too. SPD leader Sigmar Gabriel and Green Bundestag leader Jürgen Trittin were among the first signatories to the "Let's change Europe" campaign launched in summer 2011 by centre-left and Green parties in response to the economic governance 'six pack' which beefed up Commission oversight of national budgets and established fines for non-compliance with debt and deficit reduction. 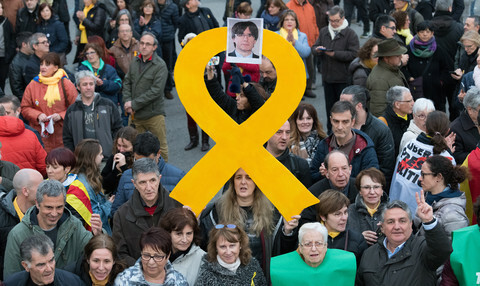 The campaign statement, with its emphasis on targeted stimulus spending in research and development, renewable energy and education, is radically different in tone with its condemnation of "blind austerity policies" and insistence that countries with trade surpluses are as much a part of the problem as those running deficits. But its commitments to establish joint liability eurobonds and a "common European fiscal policy to ensure fair, efficient and lasting receipts" would also involve a shift of economic powers to Brussels. While both sides have differing ideological positions on the political response to the eurozone crisis - they are talking about more Europe, not less. But is this in tune with voters? A Frankfurter Allgermeine poll published earlier this week indicated that 50% of Germans would vote to keep the euro if a referendum on the single currency was held. 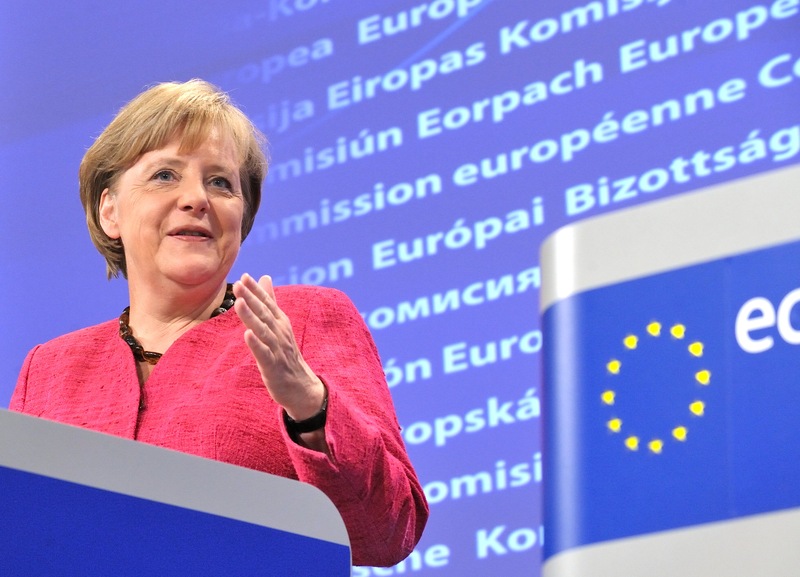 Meanwhile, a survey by UK pollsters YouGov in June found that only 43% of Germans favoured the retention of the euro against 41% that would back a return to the Deutschmark, and that Germans wanted to keep their EU membership by a margin of 51% to 28%. A wide margin, perhaps, and not a huge surprise considering that surveys by Eurobarometer and others consistently indicate that Germans are among the most pro-EU in the 27 country bloc. But this still indicates that there is a sizeable minority who are at odds with the existing division of powers between national and EU level, let alone more. However, the two dominant German parties as well as Merkel's coalition partner, the liberal Free Democrat party (FDP), and the Greens, continue to support greater EU integration and there is little chance of this changing. 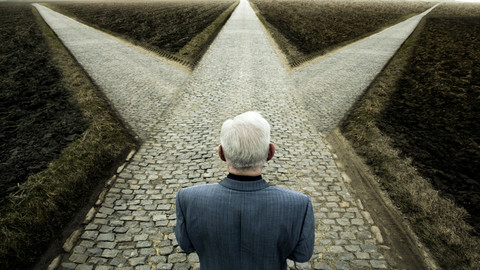 In fact, when the FDP, which was critical of the creation of the European Stability Mechanism and whose deputies have frequently expressed comfort at the prospect of Greece leaving the euro over the past two years, showed signs that it was heading in a more eurosceptic direction, it was routed in municipal and Länder elections. 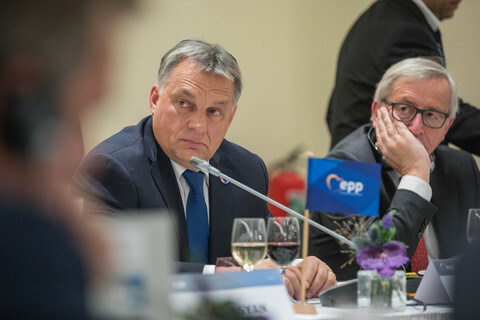 Germany is not the only EU country where there seems to be a slight disconnect between the main political parties and frustrated voters. But it is almost alone in not having a plausible eurosceptic party. Earlier this year the Front National leader Marine Le Pen scored just under 15% of the vote in the French Presidential elections. Eurosceptic parties are expected to take over a third of the poll in next month's Dutch elections, with the eurosceptic Dutch Socialist party, which has promised a referendum on the Merkel-inspired fiscal compact poised to top the poll. 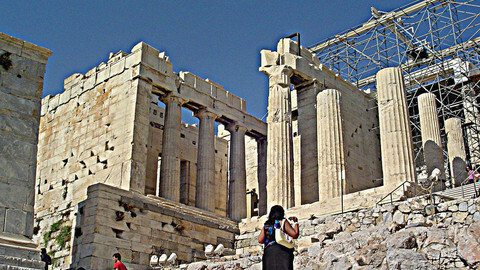 The True Finns and Greek Syriza are other eurosceptic parties that have broken the mould of their domestic party system. But for the time being, at least, German political debate is about competing visions of a future Europe - not about the existing terms. Whether this will continue if the bill for propping up the eurozone goes up and up is debatable but for the time being there are still two articles of faith in German politics: a belief in European integration and a commitment to balanced budgets and low inflation. German Chancellor Angela Merkel has said that kicking countries out of the eurozone is excluded as an option, while EU Council President Herman Van Rompuy has said that still further political pressure needs to be applied to Greece and Italy to slash their debt levels.